While I'm still working on December's post, doing the "Secret" challenge I missed in October (translation: still trying to figure out what I should write about), I finally took a look at next year's challenges. Because I did so much sewing this year - compared to previous years' output, in both clothes to wear in everyday life and historical clothes - I finally feel like it's possible for me to make sensible choices for projects, and actually follow through on them! In order to facilitate that following-through and have a published record of what I should be doing, here are my thoughts on (some of) the 2016 HSM challenges. January: Procrastination – This one is very easy. I've had a Regency morning dress half-done for about a year now, which I will need for the Battle of Ogdensburg in February, where I will be speaking! It's a lovely soft cotton twill, smallish checks on a beige ground, and the pattern is taken from Regency Women's Dress (the one with the scalloped hem). I've taken a look at what I have so far for evaluation and should have it finished well before the end of January. 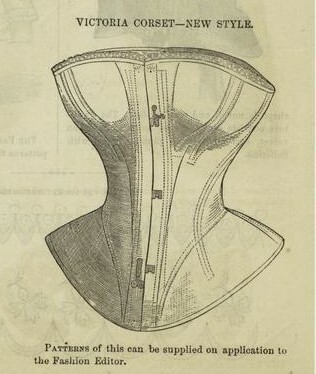 February: Tucks & Pleating – Chemisette B in Patterns of Fashion, the one with vertical pintucks over the body. Ideally, I'll also finish this well before the end of January so I can wear it with the dress, which has a wide neckline and might benefit from a bit of a fill-in. March: Protection – I'm so coordinated. I'll cut out the pieces for an apron and bring them to the Battle of Ogdensburg to sew. (Hopefully there's a lot of stuff going on inside some kind of structure?) February and March's projects being small should allow me some time on the side to sew clothes for myself for the new season. April: Gender-Bender – This one is pretty difficult for me, since my personal sense of style tends to be understated yet feminine. An obvious choice would be something like a riding habit, but that's a pretty intensive project and I'm trying to make sure these are all things I'll really need/use in order to get them finished. I haven't been posting the fall/winter dresses I've made recently, but let's just say that, influenced by Age of Adaline, my modern style is extremely vintagey, so it's completely possible for me to make everyday clothing through the HSM. I'm currently looking for a 1930s dress pattern with masculine elements that I'd wear regularly. It's very difficult. (I like this one, but I'm not sure how I'd feel about wearing it.) I may end up knitting my brother a pair of socks with a vintage pattern instead. 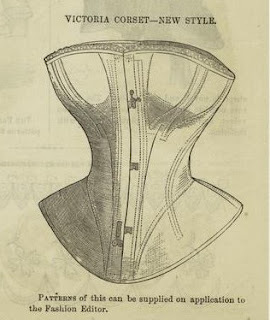 May: Holes – Going with Leimomi's suggestion of an item with eyelets, I plan by this time to make an 1850s-1860s corset. During the wedding I still haven't written up, I realized that my (1880s, used for all Victorian events) corset was nowhere near wide enough in the hips and was giving me lower back pain, and a few days later I ripped out the lower halves of the seams in order to figure out how much more ease should be added in my next one. So now I have no corset at all! And as the Civil War Weekend will still be happening in July, I'm going to need one. June: Travel – Last year I purchased a secondhand gown for the CWW, and this year I'd like to make my own. A traveling dress! 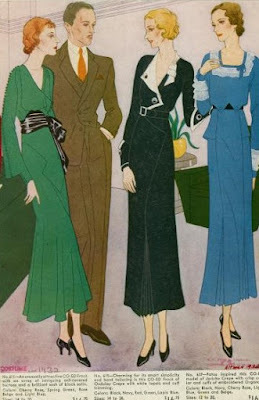 I'm doing preliminary research on what would constitute a traveling costume during this period, but think I will end up with a grey or brown tropical wool. The CWW is not a high accuracy event and doesn't have a defined date to be portraying, which gives me a lot of leeway. 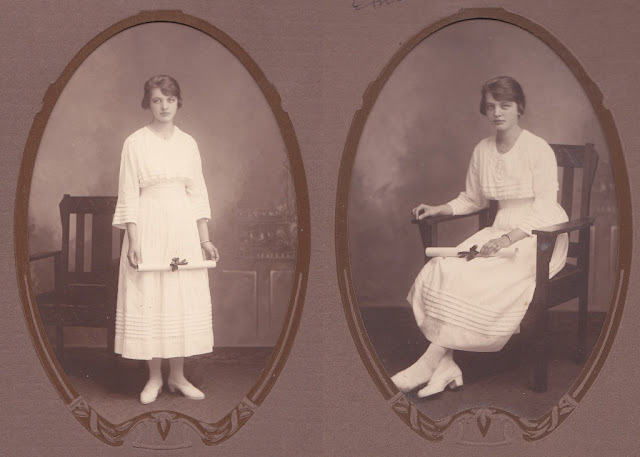 July: Monochrome – My first thought for this was to make a Little White Dress for a hypothetical future Regency event, but it might actually be nice to instead make up the commencement dress pattern I shared in August for a hypothetical future 1910s event. From August through December, I'm really not sure what I'm going to do - there are so many options! But I hope that setting all of the first half (ish) of the year's projects out like this will help me make sure that I achieve them.